Why did Saul commit suicide? He might have recalled what happened to Samson when the Philistines captured him (torture and humiliation). Saul had everything most people would want: An imposing physical presence, strength, power and wealth. But he was miserable without God, just like Solomon was a few decades later when he abandoned God for a time. Matthew 6:33 (NIV) says, “But seek first his kingdom and his righteousness, and all these things will be given to you as well.” That isn’t marketing spin or some inane advice. If we don’t put God first we won’t truly enjoy the other good things in life as much. Think about how many other rich and famous people have committed suicide because life seemed so empty to them. 31 Now the Philistines fought against Israel; the Israelites fled before them, and many fell slain on Mount Gilboa. 2 The Philistines pressed hard after Saul and his sons, and they killed his sons Jonathan, Abinadab and Malki-Shua. 3 The fighting grew fierce around Saul, and when the archers overtook him, they wounded him critically. 11 When the people of Jabesh Gilead heard of what the Philistines had done to Saul, 12 all their valiant men journeyed through the night to Beth Shan. They took down the bodies of Saul and his sons from the wall of Beth Shan and went to Jabesh, where they burned them. 13 Then they took their bones and buried them under a tamarisk tree at Jabesh, and they fasted seven days. This was a good turn of events for David. He didn’t have to fight against the Israelites, whom he was about to become king of. 30 David and his men reached Ziklag on the third day. Now the Amalekites had raided the Negev and Ziklag. They had attacked Ziklag and burned it, 2 and had taken captive the women and all who were in it, both young and old. They killed none of them, but carried them off as they went on their way. 3 When David and his men came to Ziklag, they found it destroyed by fire and their wives and sons and daughters taken captive. 4 So David and his men wept aloud until they had no strength left to weep. 5 David’s two wives had been captured—Ahinoam of Jezreel and Abigail, the widow of Nabal of Carmel. 6 David was greatly distressed because the men were talking of stoning him; each one was bitter in spirit because of his sons and daughters. But David found strength in the Lord his God. 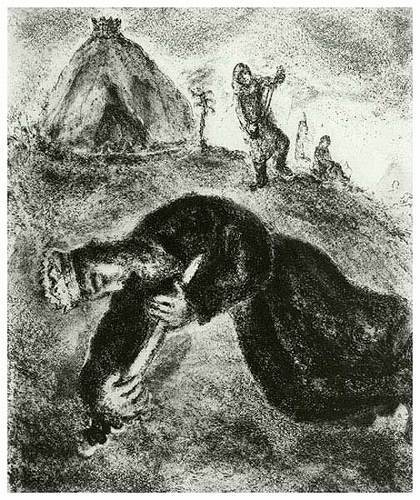 Consider David’s plight: Their town had been burned. Their wives and children had been taken. His men wanted to kill him. When we read this now we know quickly how it turned out. But imagine the panic of temporarily losing your child in a store and multiply that by 1,000. So what did David do? He turned to God. 9 David and the six hundred men with him came to the Besor Ravine, where some stayed behind, 10 for two hundred men were too exhausted to cross the ravine. But David and four hundred men continued the pursuit. 23 David replied, “No, my brothers, you must not do that with what the Lord has given us. He has protected us and handed over to us the forces that came against us. 24 Who will listen to what you say? The share of the man who stayed with the supplies is to be the same as that of him who went down to the battle. All will share alike.” 25 David made this a statute and ordinance for Israel from that day to this. God answered David’s prayers and helped them recover their families and possessions. It would have been easy to think it was just their efforts that did this. After all, how much adrenaline, effort and emotion would go into winning a battle like that? Their lives were at risk the whole time. David shared the plunder with all the men – even those too weak to fight – because he knew God was the real victor. Do I always remember to thank God for answered prayers, or do I take credit and move on to the next battle? 27 He sent it to those who were in Bethel, Ramoth Negev and Jattir; 28 to those in Aroer, Siphmoth, Eshtemoa 29 and Racal; to those in the towns of the Jerahmeelites and the Kenites; 30 to those in Hormah, Bor Ashan, Athach 31 and Hebron; and to those in all the other places where David and his men had roamed. Chapter 27 is an interesting transition period for David. Even though he killed Goliath of Gath many years earlier, he now goes to live in Gath after making a deal with King Achish. 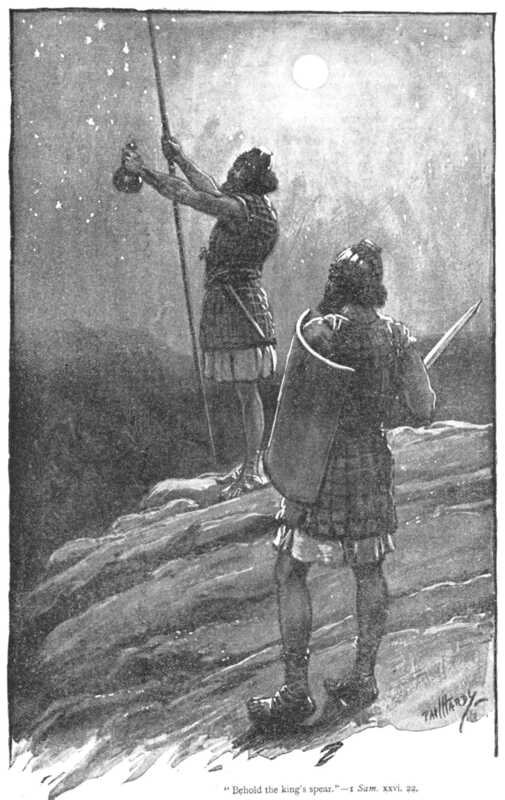 By then Achish must have known that David was Saul’s mortal enemy, so he didn’t fear David. 2 So David and the six hundred men with him left and went over to Achish son of Maoch king of Gath. 3 David and his men settled in Gath with Achish. Each man had his family with him, and David had his two wives: Ahinoam of Jezreel and Abigail of Carmel, the widow of Nabal. 4 When Saul was told that David had fled to Gath, he no longer searched for him. Saul knew that God forbade spiritists and mediums. He even put a law into place himself. But in a classic case of desperation and “do as I say, not as I do,” Saul consulted one himself. Spiritists are generally frauds. They are good at reading people and making fuzzy inferences until they get close to where people think the spiritists really have these powers. Also, Satan can use these people as well. In this case, the spiritist was just going to fake it, except God intervened to teach Saul a lesson. Notice how surprised she is when Samuel actually shows up! 20 Immediately Saul fell full length on the ground, filled with fear because of Samuel’s words. His strength was gone, for he had eaten nothing all that day and night. Saul’s reign was over. He had disobeyed God one too many times. His “repentence” was typically being sorry about the consequences and not being truly sorry about having committed the act. His repentence was worldly, not godly. We often fall into the same trap. Do we really want to change, or are we just sorry about the consequences we’ve received? For more on how David felt about these events, see Psalm 54. 25 Now Samuel died, and all Israel assembled and mourned for him; and they buried him at his home in Ramah. Then David moved down into the Desert of Maon. 2 A certain man in Maon, who had property there at Carmel, was very wealthy. He had a thousand goats and three thousand sheep, which he was shearing in Carmel. 3 His name was Nabal and his wife’s name was Abigail. She was an intelligent and beautiful woman, but her husband, a Calebite, was surly and mean in his dealings. 4 While David was in the desert, he heard that Nabal was shearing sheep. 5 So he sent ten young men and said to them, “Go up to Nabal at Carmel and greet him in my name. 6 Say to him: ‘Long life to you! Good health to you and your household! And good health to all that is yours! 12 David’s men turned around and went back. When they arrived, they reported every word. 13 David said to his men, “Put on your swords!” So they put on their swords, and David put on his. 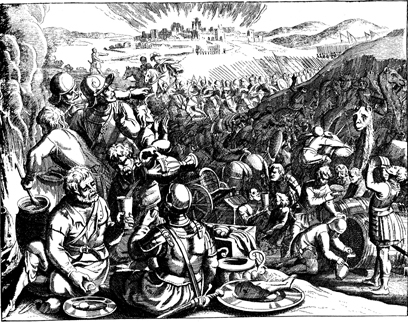 About four hundred men went up with David, while two hundred stayed with the supplies. 18 Abigail lost no time. She took two hundred loaves of bread, two skins of wine, five dressed sheep, five seahs of roasted grain, a hundred cakes of raisins and two hundred cakes of pressed figs, and loaded them on donkeys. 19 Then she told her servants, “Go on ahead; I’ll follow you.” But she did not tell her husband Nabal. 23 When Abigail saw David, she quickly got off her donkey and bowed down before David with her face to the ground. 24 She fell at his feet and said: “My lord, let the blame be on me alone. Please let your servant speak to you; hear what your servant has to say. 25 May my lord pay no attention to that wicked man Nabal. He is just like his name—his name is Fool, and folly goes with him. But as for me, your servant, I did not see the men my master sent. 36 When Abigail went to Nabal, he was in the house holding a banquet like that of a king. He was in high spirits and very drunk. So she told him nothing until daybreak. 37 Then in the morning, when Nabal was sober, his wife told him all these things, and his heart failed him and he became like a stone. 38 About ten days later, the Lordstruck Nabal and he died. 41 She bowed down with her face to the ground and said, “Here is your maidservant, ready to serve you and wash the feet of my master’s servants.” 42 Abigail quickly got on a donkey and, attended by her five maids, went with David’s messengers and became his wife. 43 David had also married Ahinoam of Jezreel, and they both were his wives. 44 But Saul had given his daughter Michal, David’s wife, to Paltielson of Laish, who was from Gallim. Abigail kept David from doing a rash and evil thing. While Nabal’s actions were greedy and foolish, they didn’t warrant mass murder. Blessed are those who prevent us from doing stupid things! 2 So Saul went down to the Desert of Ziph, with his three thousand chosen men of Israel, to search there for David. 3 Saul made his camp beside the road on the hill of Hakilah facing Jeshimon, but David stayed in the desert. When he saw that Saul had followed him there, 4 he sent out scouts and learned that Saul had definitely arrived. It is not clear how much time elapsed between the times Saul tried to kill David. David spent roughly 10 years on the run, which could easily have led him to be impatient. Yet he refused to take matters into his own hands and kill Saul himself. David was also smart to do something generous when Saul was close to him. That shamed Saul into stopping his attempts at murder – at least temporarily. For more on how David felt about these events, see Psalm 57 or Psalm 142. David probably had the priest use the Urim and Thummim (think of a kind of dice) to determine the Lord’s will, as was customary at the time. To me, the broader lesson is to stop and consider the Lord’s will before we do something. Some of my larger mistakes have been when I didn’t consider God’s perspective on something first. Once that was done deliberately because I was afraid I wouldn’t like the answer. Bad idea!! 7 Saul was told that David had gone to Keilah, and he said, “God has handed him over to me, for David has imprisoned himself by entering a town with gates and bars.” 8 And Saul called up all his forces for battle, to go down to Keilah to besiege David and his men. 14 David stayed in the desert strongholds and in the hills of the Desert of Ziph. Day after day Saul searched for him, but God did not give David into his hands. 15 While David was at Horesh in the Desert of Ziph, he learned that Saul had come out to take his life. 16 And Saul’s son Jonathan went to David at Horesh and helped him find strength in God. 17 “Don’t be afraid,” he said. “My father Saul will not lay a hand on you. You will be king over Israel, and I will be second to you. Even my father Saul knows this.” 18 The two of them made a covenant before the Lord. Then Jonathan went home, but David remained at Horesh. 26 Saul was going along one side of the mountain, and David and his men were on the other side, hurrying to get away from Saul. As Saul and his forces were closing in on David and his men to capture them, 27 a messenger came to Saul, saying, “Come quickly! The Philistines are raiding the land.” 28 Then Saul broke off his pursuit of David and went to meet the Philistines. That is why they call this place Sela Hammahlekoth. 29 And David went up from there and lived in the strongholds of En Gedi. 24 After Saul returned from pursuing the Philistines, he was told, “David is in the Desert of En Gedi.” 2 So Saul took three thousand chosen men from all Israel and set out to look for David and his men near the Crags of the Wild Goats. 3 He came to the sheep pens along the way; a cave was there, and Saul went in to relieve himself. David and his men were far back in the cave. 4 The men said, “This is the day the Lord spoke of when he said to you, ‘I will give your enemy into your hands for you to deal with as you wish.’” Then David crept up unnoticed and cut off a corner of Saul’s robe. 5 Afterward, David was conscience-stricken for having cut off a corner of his robe. 6 He said to his men, “The Lord forbid that I should do such a thing to my master, the Lord’s anointed, or lift my hand against him; for he is the anointed of the Lord.” 7 With these words David rebuked his men and did not allow them to attack Saul. And Saul left the cave and went his way. Please add any reflections that you have. For more on how David felt about these events, see Psalm 34 and Psalm 52. David fled Saul’s attempts at murder and appears to have been on the run roughly from the time he was 20 until he was 30. It is hard to imagine being a fugitive for that long. Remember, we know how the story ends. David trusted in God, but those must have been long years. 5 David replied, “Indeed women have been kept from us, as usual whenever I set out. The men’s things are holy even on missions that are not holy. How much more so today!” 6 So the priest gave him the consecrated bread, since there was no bread there except the bread of the Presence that had been removed from before the Lord and replaced by hot bread on the day it was taken away. Technically giving this bread broke a law from Leviticus. But as Jesus pointed out in Matthew 12:1-8, the laws of love and life were a higher priority. 7 Now one of Saul’s servants was there that day, detained before the Lord; he was Doeg the Edomite, Saul’s head shepherd. This was an enemy of Israel, but he may have wanted to get to know David because he had fled from King Saul. They did not know that David would be the next king. By acting insane he avoided harm. 22 David left Gath and escaped to the cave of Adullam. When his brothers and his father’s household heard about it, they went down to him there. 2 All those who were in distress or in debt or discontented gathered around him, and he became their leader. About four hundred men were with him. But the king’s officials were not willing to raise a hand to strike the priests of the Lord. Saul displays his paranoia once again and has countless innocent people killed. For more on how David felt about these events, see Psalm 59. Jonathan was a great friend to David and a good son to Saul, trying to help Saul avoid doing something despicable. 9 But an evil spirit from the Lord came upon Saul as he was sitting in his house with his spear in his hand. While David was playing the harp, 10 Saul tried to pin him to the wall with his spear, but David eluded him as Saul drove the spear into the wall. That night David made good his escape. That is a curious passage. Saul’s heart was far from God, but God still have him some words to say. David will remember this promise years later and restore one of Saul’s relatives to his table. 34 Jonathan got up from the table in fierce anger; on that second day of the month he did not eat, because he was grieved at his father’s shameful treatment of David. 42 Jonathan said to David, “Go in peace, for we have sworn friendship with each other in the name of the Lord, saying, ‘The Lord is witness between you and me, and between your descendants and my descendants forever.’” Then David left, and Jonathan went back to the town. What an amazing example of friendship. Do we strive to be the same kind of friends for those in our lives?